Latitude 53 presents the first in a new series of artist projects, inviting local artists to create new work specifically for The Garage space. Latitude 53 is honoured to exist in a building that was a safe gathering space for queer communities from 1969–2012, and The Garage (as this part of the building was for a time known) pays homage to the history of this place, as does Zachary Ayotte’s inaugural project. The building where Latitude 53 now exists was a queer gathering space beginning in 1969, as Club 70, The Cha Cha Club, The Junction, Boots & Saddles and The Garage Burger Bar. In the space formerly occupied by that burger joint, Zachary Ayotte’s new body of work engages in remembrance and rethinking of the gradual disappearance of queer spaces in our city. 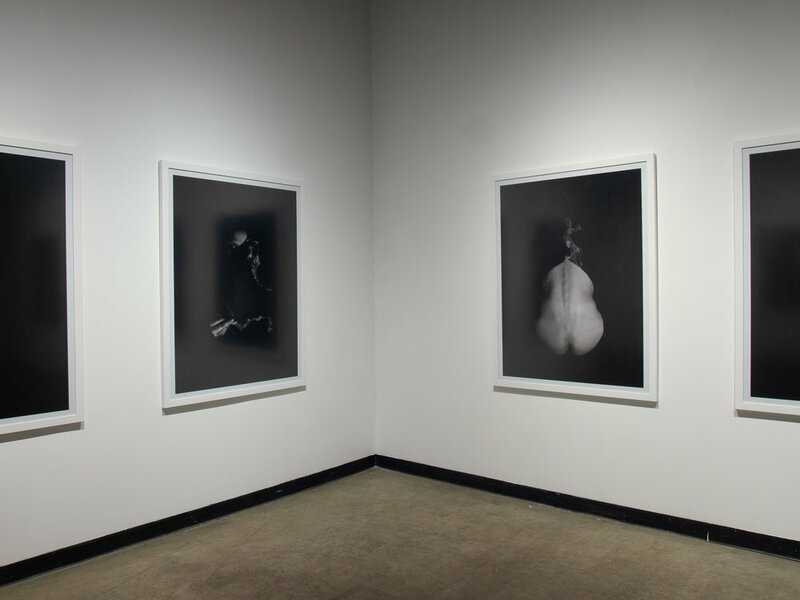 BAMF is a series of human-scale images of bodies slipping into the aether, shot on a medium format camera with black-and- white film. As they vanish, they leave behind trails of dust, the black air closing in and swallowing the spaces they leave behind. Ayotte is interested in the relationship of the physical—bodies and the spaces they inhabit—to our conceptual and political landscapes. When these places don’t stay open, how do they live on, and how do they inform our other approaches to community? BAMF takes its name from an onomatopoeia first used in X-MEN comics in the 1970s. The word, which describes the sound of air rushing in to fill the space of an absent body, speaks to a sense of disappearance and to the pressures that shift imperceptibly in the spaces around and within us. Zachary Ayotte was born in Yellowknife, NT in 1981. He graduated from the University of Alberta in 2004 and went on to study photography at the North Alberta Institute of Technology. His recent work is interested in the bounds of seeing and limits to how we engage with visual information. Drawing on the nature of photography itself, Ayotte is interested in exploring the way the invisible becomes apparent when it interacts with physical forms. He works with 35mm and medium format film and utilizes a variety of both natural and artificial light sources. He lives in Edmonton, AB.